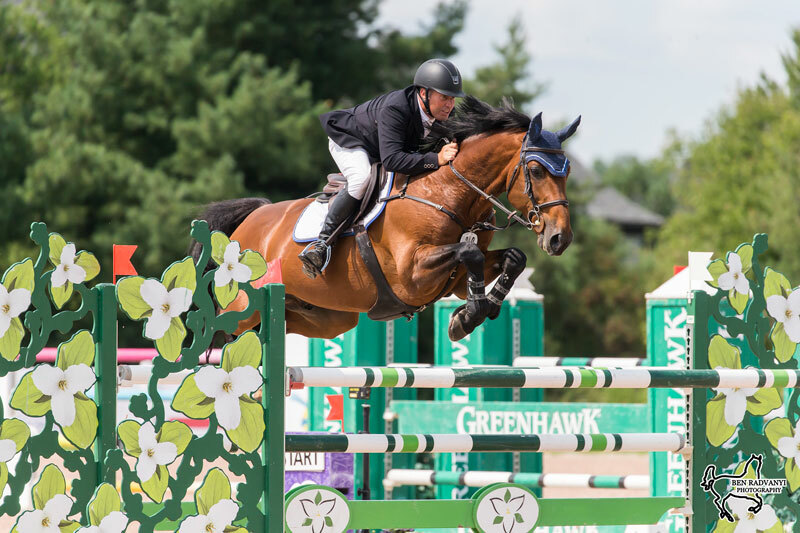 Jim Ifko of Calgary, AB, made his trip east count by winning both the $35,500 CSI2* Jumper Classic and the $50,000 CSI2* Grand Prix at the Caledon Premier 2 show jumping tournament held August 8 to 12 at Caledon Equestrian Park in Caledon, ON. “I’m lucky to have a horse that likes to win even more than I do!” smiled Ifko following his second straight win in Fédération Equestre Internationale (FEI) sanctioned competition. On Friday, August 12, Ifko topped an eight-horse jump-off riding Un Diamant des Forets to claim victory in the $35,500 CSI2* Jumper Classic, Presented by RAM Equestrian. His winning time of 36.30 seconds was almost three seconds faster than that of fellow Calgarian, Vanessa Mannix, 29, who stopped the clock in 39.15 seconds riding Catinka 25, her nine-year-old Oldenburg mare (Catoki x Luxano). Hyde Moffatt, 39, of Brantford, ON, was the only other rider to jump double-clear, taking third with a time of 39.41 seconds aboard Granturo, his 12-year-old Belgian Warmblood gelding (Canturo x Kashmir van Schuttershof). It was déjà vu for Ifko on Sunday, as he once again qualified for an eight-horse jump-off in the $50,000 CSI2* Grand Prix, Presented by Pommies. As the penultimate entry in the jump-off, Ifko was chasing a leading time of 42.93 seconds set by Keean White, 35, of Rockwood, ON, riding Tahiorn, a seven-year-old Italian Sport Horse mare (Kashmir van Schuttershof x Corland) owned by Jamie Duva and Eques Investments. Ifko left all the rails in place before galloping down to the final fence, stopping the timers in 40.09 seconds to move into top spot. As the final entry, White had the opportunity to reclaim the lead riding Leilani, an eight-year-old Oldenburg mare owned by Angelstone Farms and Lisa Marie Gauthier. The pair came close, but not close enough, with their time of 40.64 seconds leaving them in second place. White also took third with Tahiorn while Mannix and Catinka 25 again jumped double clear for fourth place in a time of 42.97 seconds. Moffatt rounded out the top five with a double clear effort in 44.65 seconds, this time with Grafton, a 12-year-old selle francais stallion (Calvaro x Vondeen) owned by Ariel Grange. For the second time, Ifko and Un Diamant des Forets led the victory gallop during the Caledon Premier 2 tournament. “We got him when he was six years old and he’s 10 now,” said Ifko of the selle francais stallion (Diamant de Semilly x Papillon Rouge) owned by Eventyre Farms Ltd. “Over the last four years, we’ve been developing him. Each year, we keep thinking he has more potential, and each year he keeps answering all the questions. Luckily enough, we have found ourselves in these grand prix classes. Ifko’s winning week marked his second trip to the Caledon Equestrian Park, having competed at the 2015 Pan American Games equestrian venue one year prior. Show jumping competition continues throughout the 2018 season at the Caledon Equestrian Park with the fourth and final FEI competition of the year, the CSI2* Canadian Show Jumping Tournament, taking place from September 19 to 23. Competition organizer Equestrian Management Group hosted a total of four FEI-sanctioned competitions throughout the 2018 season. For more information on the CSI2* Caledon Premier 2, including full results and a full competition schedule, visit www.caledonequestrianpark.com.